BARA, Jan 23: Ruslan Three Star Club has advanced into the semifinals of the ongoing 10th Simara Gold Cup football tournament with a 2-0 win over Sankata Club in Bara on Tuesday. 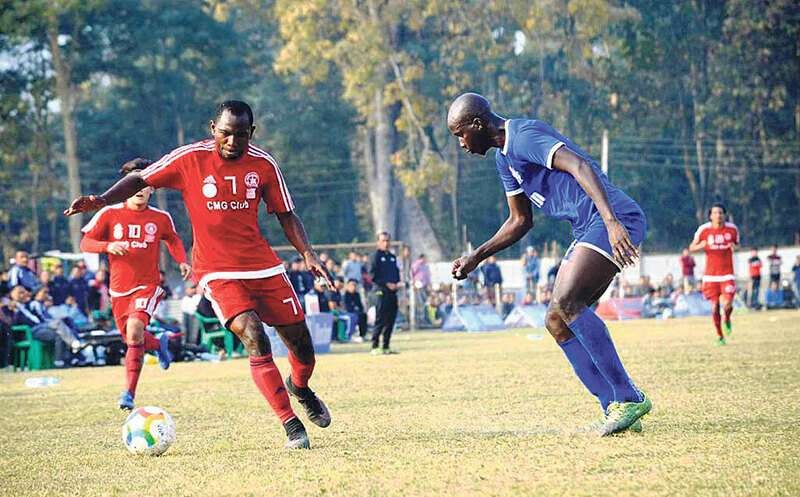 At the Simara Stadium, goals from Fode Fofana and Sushan Shrestha helped the team reach the last four of the tournament. Fofana gave Three Star a lead in the 13th minute as he converted a good pass from Ranjan Bista from inside the danger box. Shrestha doubled Three Star’s lead in the 85th minute as Rupesh KC hit a free-kick, and the ball hit the defender. The defender failed to clear the ball and Shrestha took advantage of the situation. Sankata lost the match failing to convert the chances in got in front of the goal. Saroj Dahal’s shot in the first minute of the injury time was saved by Three Star keeper Alan Neupane. Cedric Aba dribbled the ball from the center line, but he was denied by Three Star defender Doumbia. Three Star also got some chances to score. Sunil Bal crossed the ball to Fofana, but his header went wide in the 53rd minute. Fofana again got a chance from inside the box, but it was saved by Sankata keeper Raja Babu Thapa. Bista headed the ball in the 70th minute, but it was cleared from the goalline by Saroj Dahal of Sankata. Three Star defender Doumbia was named the man of the match for his defensive performance and was rewarded with Rs 10,000.